Cultural pluralism; United States; History; Sources. 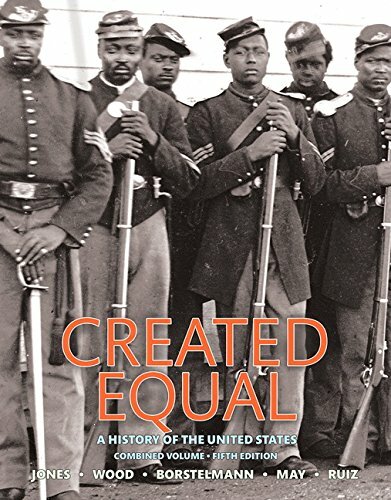 Created Equal: A History of the United States frames the American experience as the stories of various groups of men and women, all âcreated equalâ in their common humanity, claiming an American identity for themselves. Presenting a rich historical analysis in a chronological framework, the authors challenge students to think critically about the ongoing struggles over equal rights and the shifting boundaries of inclusion and acceptance that have characterized American history. Updated with the latest data and statistics, the Fifth Edition covers contemporary issues of inclusion such as marriage equality and the reopening of diplomatic relations with Cuba. MyHistoryLab for the U.S. History survey course extends learning online to engage students and improve results. Media resources with assignments bring concepts to life, and offer students opportunities to practice applying what theyâve learned. Please note: this version of MyHistoryLab does not include an eText. Created Equal: A History of the United States, Eighth Edition is also available via REVELâ¢, an interactive learning environment that enables students to read, practice, and study in one continuous experience. Note: You are purchasing a standalone product; MyLabâ¢ & Masteringâ¢ does not come packaged with this content. Students, if interested in purchasing this title with MyLab & Mastering, ask your instructor for the correct package ISBN and Course ID. Instructors, contact your Pearson representative for more information.